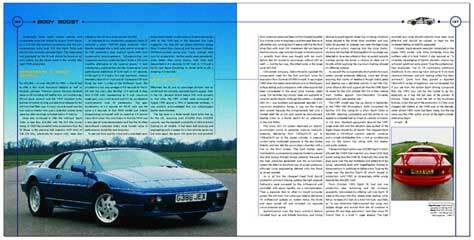 Lotus Esprit World was given a review copy of 'the Official Story' at it's launch at the Club Lotus Show (Donington on 18th March 2006). We had very little info before we received this copy. We prepared our interview with Author Jeremy Walton with general questions about both the old book and this new book. Now we have had a chance to read the 'Official Story' and give you an review of how good it is. In our interview with Jeremy, we were unaware of the content of the 'Official Story' and linked it with his earlier book the 'Complete Story'. After meeting and chatting to Jeremy we found out more about the older book and why he's not keen to have it dug up. Something is to do with the title, which he wanted to change, but the publishers were unwilling. Even to call it the 'Complete Story 1976-91'. So the 'Official Story' is the book Jeremy wanted to write to help move away from the 'Complete Story'. Starting a fresh and working with Coterie Press, Jeremy knew the book would be something special and that he would be proud to give his name and reputation to. When finally got our hands on a copy at the show and were surprised by the format, quality and content. You can see from the pictures below, this is a special book. Flicking through, we saw pictures, specs and sketches we'd never seen before, some infomation from Factory sources we hadn't heard of and all in a large format, high quaility book. If you're familar with previous Lotus titles by Coterie Press, you'll know what to expect. This is really a coffee table show book, but with real content. With over 220 pages of pure Esprit heaven, it was always going to be a hit with LEW. But due to some of the information being so exclusive, we couldn't put it down! We don't want to give too much away, but any Esprit fan will be more than happy to have this in their collection. Covering all the models and people involved, you'll learn things you never knew about the Esprit. See pictures you'd thought would have been lost forever and see images you love of the greatest car to ever roll off any production line. We give this a 5/5 rating. A must have for true Esprit fans. 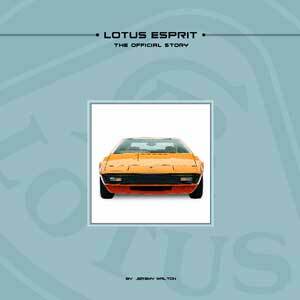 Lotus Esprit The Official Story is the inside story of Britain’s best loved supercar from it’s development in the early 1970’s right through to the 21st century. That the Esprit ever appeared in the showroom, never mind set a record for British sportscar continuous production from 1976-2004, is a story straight from the Lotus era. How Colin Chapman laboured alongside Italian designer and fellow genius Giorgetto ‘Giorgio’ Giugiaro to bring the first show Esprits to life, is just one of the stories unveiled by Jeremy Walton’s research. 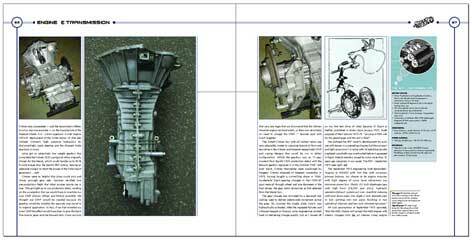 The Esprit, in all its Lotus Type numbers and derivatives from the very first Type 79 onwards, is revealed in this seriously comprehensive book. A total of under 11,000 Esprits were made in it’s 28 year production span, which means that some models had production numbers of less than 100 and have therefore become extremely collectable. Supremely agile and rapid Esprits such as the Sport 300 and V8 350 are examined in all their 160 to 175 mph glories – along with the race track inspired Esprit Turbo SCCA, X180R and Type 114 Esprit GT1. As with Walton’s acclaimed Lotus Elise title for Coterie, this conscientious Esprit production was enabled only by the full co-operation of Lotus Cars. Once again they gave frank access to their archives as well as their employees. 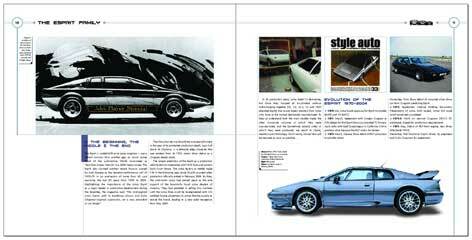 Lotus Esprit The Official Story contains the reminisces of the loyalists and the youngsters who added to their growing reputations when involved in the concept and design of the Esprit, many who are now famous industry figures following a Lotus apprenticeship. The author’s trusted participation at every stage in the Esprit’s long life is reflected by the openness of all involved. They tell us the real stories behind the car, leaving us with hope of an innovative new Esprit before too long. Coterie Press will be launching a very special Publisher's Edition that will be available of this title. They are producing just 100 copies of the Publisher's Edition which will be leather bound in top quality black hide with the Esprit logo embossed on the front cover. Each copy will come in a cloth covered clamshell presentation case, the 258 pages will be gilt edged and will have a gold ribbon page marker. Every one of the 100 copies will be individually signed and numbered by Former Lotus Executive, Mike Kimberley, the Author Jeremy Walton, and the Publisher William Taylor. This Publisher's Edition features an additional 32 pages that are not present in the Limited or Standard editions. 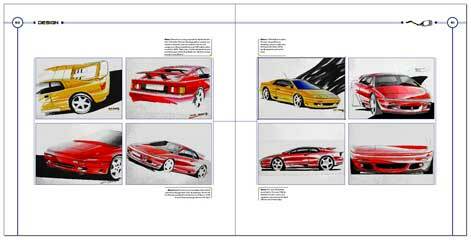 These pages will show previously unseen photography and drawings of the prototype Esprit including a fold out page with an original drawing by Giugiaro. Shipping is FREE for all orders within the USA and Europe. This edition will not be available in bookshops. If you would like to reserve a copy all you need do is email a reservation request to them at coterieltd@aol.com with your address and payment details. A confirmation of your reserved copy will be sent to you by return. Your Publisher's Edition will be despatched directly to you upon the release date in March 2006. Payment will not be taken until date of despatch. Details of both the Limited and Standard edition of this title are shown on pages 17 and 19 of their catalogue.